Plans for a dedicated Child Poverty Unit aimed at meeting the government's target of halving child poverty by 2010 are to be unveiled by ministers. The government says it has helped 600,000 out of poverty but a million more must be aided to meet the target. The unit will try to achieve this by better co-ordination of efforts by government and other agencies. 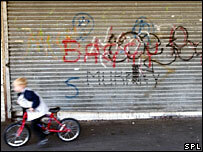 The Child Poverty Action Group has said there is "no way" the 2010 target will be met on current rates of spending. The government aims to "break cycles of deprivation" by improving health and education and getting parents working. Work and Pensions Secretary Peter Hain said a clear, cross-government approach was needed to eradicate poverty. The new unit, which will involve officials from the Department for Work and Pensions and the Department for Children, Schools and Families, will work closely with the Treasury, local government and other government agencies and provide a single point of contact on child poverty issues. Ed Balls, Secretary of State for Children, Schools and Families, said ending child poverty was a "moral imperative" and it was important that past success did not "plateau". Mr Hain admitted halving child poverty by 2010 would be tough, but said the new unit would be at the forefront of efforts to reduce it by bringing departments and others involved together to build on previous successes. "We do have to do more and that's the purpose of this poverty unit within Whitehall," Mr Hain told BBC Radio 4's Today programme. A major part of the plan will be to get single parents back into work. But Mr Hain said "this will not be a forced regime where, regardless of circumstances, you have to work". He said: "Individual family circumstances will have to be taken into account - if there's a disabled child for example - and, more important than any of this, the childcare, affordable childcare, needs to be available." The Conservatives dismissed the unit as an initiative "designed to catch the headlines". Shadow work and pensions secretary Chris Grayling said: "The truth is the number of children living in poverty is going up not down, and ministers are failing to get to grips with the issues that underlie child poverty, like the escalation of family breakdown." The Liberal Democrats called for an immediate increase in child benefit, and resources for educating the most disadvantaged children. Spokesman Danny Alexander said: "Less bureaucracy is needed to end child poverty, not more. At the current disgracefully slow pace, child poverty will not be abolished until 2049."